I can’t see. That’s a fine cup of tea for a writer/reader/teacher. (And I do, BTW, like tea). A few years ago I had cataract surgery. 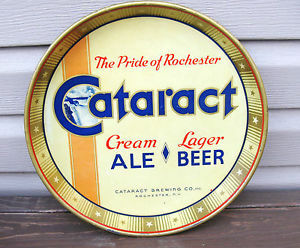 (Did you know there was once a beer named Cataract? My ophthalmologist has a vintage advertising tray in his office with the name of the beer intertwined with a waterfall. There’s a story there, but I’ll save that for another day). After my cataract surgeries it was like a whole new world for my distance vision, but a jumbled mass of words and objects for my close-up sight. Anyway, as a result of these surgeries, I developed a complication which I can only describe as a sort of scar tissue. The effect was like looking through wax paper. And forget close-up vision. Every time I tried to grade papers, read a book or write anything I ended up with a searing headache. Enter laser surgery. Eye number one was operated on in February, and eye two is scheduled for next week. I am so desperate to see that I don’t even care about having my head immobilized while this incredibly intense light (laser) burns away all that gnarly crap that was rude enough to steal away my vision. All of this is done while awake and in the doc’s office. The morale of this story? Other than to embrace these maturing awakenings with humor, there really is none. Is there?